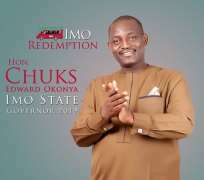 The governorship candidate of All Grand Alliance Party (AGAP) Imo state, Hon. Okonya Edward opined recently that he resisted collecting Millions of Naira from some undisclosed sources to sellout his party's ticket as the party standard bearer. Speaking to newsmen, the former Local Government Chairman of Oguta LGA further revealed that he is full of thanks to God that he was able to overcome the temptation, as he effectively resisted the many attempts to lure him into accepting millions of Naira just to pave way for some undisclosed highly placed people in the society that wanted to hijack the party for selfish reasons. According to him, it can only take a man with the fear of God and solid pinciple to resist such mouth watering offers in Nigeria of today. "I resisted it because to me Money is not everything in life and one cannot forget that we came to this world with nothing and we will go back to God with nothing. I know I need money, but not at the expense of Imo people who have been suffering and desirous of good governance in 2019". "We all have conscience and should know that any thing done to sabotage the people will definitely work against me in the future. I thank God I can stand tall and bold with the masses finally" he said. Last week, there was an alleged dramatic twixt in Abuja at the National headquarters in which Governor Okorocha’s son In-law, Hon Uche Nwosu was allegedly tipped to have finalized flying the Party’s flag for 2019 governorship election after an unsuccessful attempt to use the Social Democratic Party (SDP). it is obvious with what Hon Okonya is saying the attempt to lure him to sellout the party may not be unconnected to the alleged arm-twisting in Abuja a development which came as a rude shock to political watchers, and has kept many AGAP members dumbfounded. In another development, one of the frontline aspirants in the person of Dr. Iroegbu Njoku has threatened to go to court against the candidacy of Uche Nwosu, if the party fails to reverse the decision. Dr Njoku who claimed to have been the rightful winner of the 7th October, 2018 primaries of AGAP equally claimed he has the financial muscle, capacity and technical know-how and vowed never to allow any body no matter how highly placed to ridicule his efforts in the party not to talk of taking his mandate.